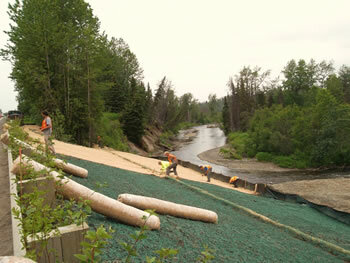 Matting Slopes, Kenai Flood Repair. Requests for Proposals (RFPs) for Construction-Related Transportation Development. Alaska Statute Section 36.30, The State Procurement Code, contains the basic provisions for Competitive Sealed Proposals and Small Procurements. Details of the procedures are available in the manuals that are available here. This website and the State of Alaska Public Notices web page are the primary means of advertising these RFPs. RFP holder lists for PSA projects are provided by links in the project listings when they are available. Currently no "subscription" lists of interested parties nor lists for small procurements are maintained. Both types of proposals are available for download here. Occasionally, "Design-Build" solicitations which require professional services are advertised through our Construction Bidding web pages. Emergency and small procurement construction contracts are handled directly by project managers and are not usually posted to the web. Disadvantaged Business Enterprises are encouraged to submit proposals. The State of Alaska is an Equal Opportunity Employer and it complies with Title II of the Americans with Disabilities Act of 1990. Individuals with disabilities, including the hearing impaired, who need auxiliary aids, services, and or special considerations to submit a proposal must contact a TTD number shown below at least 24 hours prior to an RFP submittal time to make arrangements.